Black Friday. Cyber Monday. It’s about getting it all NOW. Ironically, we put off non-shopping choices until later. Autograph collectors know this well. 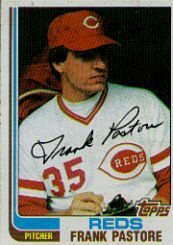 Frank Pastore was a generous, even easy, autograph by mail. A man in his 50s. Collectors could get him any time, right? One motorcycle accident has changed everything. Pastore’s future is uncertain. Forget methods and systems, ages and availabilities. If you want an autograph, or if you want to thank a player from YOUR past, don’t wait. You heart may know more than your head. Coming Monday: Thoughts on Christmas cards. Mr. Pastore had a very promising baseball career until a Steve Sax line drive hit him on the elbow which proved to be the turning point in a promising baseball career. I was one of the fortunate ones that had reached out to Mr. Pastore at least a year before his accident and got him on several cards. However Mr. Pastore’s greatest moments came as a Christian talk show host in California.